Son of Stanley and Percie , of Simcoe, Ontario. 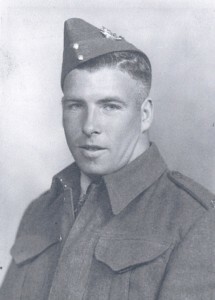 His brother, Trooper Allan Joseph Anderson, Governor General’s Horse Guards, R.C.A.C., died in service at the age of 21, on September 26, 1944. The Dieppe Raid, also known as The Battle of Dieppe, Operation Rutter or later on Operation Jubilee, during the Second World War, was an Allied attack on the German-occupied port of Dieppe on the northern coast of France on 19 August 1942. The assault began at 5:00 AM in the morning and by 9:00 AM the Allied commanders had been forced to call a retreat. Over 6,000 infantrymen, predominantly Canadian, were supported by large British naval and Allied air force contingents. The objective was to seize and hold a major port for a short period, both to prove it was possible and to gather intelligence from prisoners and captured materials while assessing the German responses. The Allies also wanted to destroy coastal defences, port structures and all strategic buildings. No major objectives of the raid were accomplished. A total of 3,623 of the 6,086 men who made it ashore were either killed, wounded, or captured (almost 60%). The Allied air forces failed to lure the Luftwaffe into open battle, and lost 106 aircraft. The Luftwaffe only lost 48 aircraft while the Royal Navy suffered 555 casualties. The catastrophe at Dieppe later influenced Allied preparations for Operation Torch and Operation Overlord.